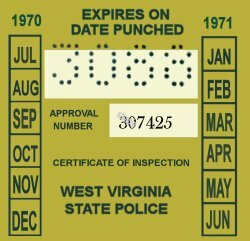 1970-71 West Virginia INSPECTION Sticker - $20.00 : Bob Hoyts Classic Inspection Stickers, Add a Final Touch to your Restoration! This 1970-71 West Virginia INSPECTION sticker, 2 1/2 x 2 1/2 inches was carefully restored and reproduced to completely remain faithful in color and size, front and back, to the original. It has a new modern "Peel and Stick" adhesive to place it on your inside windshield like the original. Our thanks to Jim Winter of Winfield WVA for providing us with a correct image.